Adopt-A-Forest Program in the Taguibo Watershed: Whatâ€™s Up? Butuan City Water District (BCWD) designed an “Adopt-A-Forest Program” for those individuals, institutions and organizations that would like to donate or provide funds for one or more hectares to be reforested in the Taguibo Watershed. The cost of the program is approximately Seventy Five Thousand Pesos (Php 75,000.00) per hectare that will be planted with seedlings and maintained for three years. BCWD Board of Directors approved the said program through Resolution No. 080-2013 dated June 17, 2013. The Taguibo River was proclaimed as a Watershed Forest Reserve by President Fidel V. Ramos under Proclamation No. 1076 on September 4, 1997. The area covers 4,367.44 hectares which include Barangay Anticala in Butuan City, Barangay San Antonio in Remedios Trinidad Romualdez (RTR) and Barangay Mahaba in Cabadbaran and a portion of Sibagat, Agusan del Sur. The rationale of its proclamation is to establish the Taguibo River Watershed Forest Reserve for the purpose of protection, maintenance and improvement of its water yield and providing restraining mechanism for inappropriate forest exploitation and land use practices. The Taguibo Watershed plays a great role to all the Butuanons as this is the main source of potable water supplied by BCWD. The Watershed also supplies water to National Irrigation Administration’s (NIA) irrigation dams servicing to vast hectares of rice lands and a source of livelihood for watershed occupants. With the continuous exploitation of the watershed resources, a threat to imbalanced ecosystem is clearly manifested (DENR, Taguibo Integrated Watershed Management Plan). The Taguibo Watershed is part of the Hilong-Hilong Range of the Northeastern Mindanao which is rich in biodiversity. The forest cover of this watershed is now dwindling and is considered in critical state due to overexploitation and lack of management. Continued human activities within the watershed will always lead to an expansion of watershed areas affected by deforestation, soil erosion, declining soil productivity and deterioration of water quality and quantity (Leaf Foundation, Sustainable Watershed Development and Management Plan of Taguibo Watershed). Despite of the proclamation of the Taguibo Watershed as a Forest Reserve, unscrupulous individuals have been devastating the watershed. The illegal activities - manganese mining, timber poaching and construction of road in the watershed greatly affect the quality of the Taguibo River. The composite team, formed by the Department of Environment and Natural Resources (DENR), in its report dated September 11, 2009, confirmed the occurrence of illegal activities in the Taguibo River Watershed Forest Reserve (TRWFR) particularly located in Barangay San Antonio, Municipality of Remedios T. Romualdez (RTR), Province of Agusan del Norte. Frequent occurrence of turbid water and drop in surface water volume of the Taguibo River are the results of these illegal activities and other anthropogenic or human induced activities happening inside the watershed. This indicates that the water holding capacity of the Taguibo Watershed is now waning due to loss in forest cover. In order to restore the Taguibo Watershed’s integrity and improve its quality and quantity of water, there is a need to implement a massive reforestation program. However, massive reforestation program requires considerable budget to include its maintenance activity. Thus, BCWD implemented small scale reforestation project in the area. Various groups and organizations conducted tree-planting activities inside the watershed area. Nevertheless, many tree-planting activities that were conducted in the area failed because of lack of maintenance program after the seedlings have been planted. This prompted BCWD to design an “Adopt-A-Forest Program.” This is to ensure that the seedlings provided will be planted, well-maintained and be monitored regularly. In this manner, we can assure high survival rate of the planted seedlings and eventually enhance the forest cover of our Taguibo Watershed. Adopt-A-Forest Program will make possible for every one of us to proactively involve in the protection and preservation of our watershed by planting and growing trees and/or by just donating funds for the reforestation project. BCWD, in partnership with local farmers particularly the Anticala Watershed Farmers Producers Cooperative (AWFPC), will be the one to select a site for the project. BCWD will also assist in the site preparation, coordination with project beneficiaries and all other activities of the project. Species that will be used in the project will depend on the selected site and the desired species of the farmers or beneficiaries. However, most common species that were used in various tree-planting activities implemented in the Taguibo Watershed area are Narra, Tugas, Lauan, Bamboo and other endemic species in the area depending on the availability of the seedlings. In addition, fruit tree seedlings such as Durian, Lanzones and Rambutan were also included; this will also serve as livelihood program for the beneficiaries or claimants of the project sites. Logically, it is BCWD’s responsibility to monitor, supervise and ensure proper implementation of the maintenance activities of the project and will provide status reports and updates to the donors regarding the project to include geocam/geotag photos and Geographical Information System (GIS) generated maps. Donors may opt to visit the site anytime to check and verify the project. Donors shall coordinate with BCWD for the proper disbursement and allocation of fund particularly for the site preparation and other related activities. If the disbursement of fund will be through the BCWD, then BCWD will provide liquidation of all expenses to the donors. The Joint Rotary Clubs of Butuan North and Makati Salcedo expressed their interest to participate in the Adopt-A-Forest Program to help save the Taguibo Watershed. On November 5, 2013, BCWD and the joint Rotary Clubs of Butuan North and Rotary Makati Salcedo signed a Memorandum of Agreement (MOA) to formalize their involvement to BCWD’s Adopt-A-Forest Program, and agreed to provide fund in the full sum amount of FIFTY THOUSAND PESOS (P50, 000.00). Approximately, 600 seedlings of various grafted fruit and forest trees were planted in the area claimed by Mr. Benido Sabote, located at Sitio Tagkiling, Barangay Anticala, Butuan City. The implementation of the reforestation was in coordination with the Anticala Watershed Farmers Producers Cooperative (AWFPC), BCWD’s partner organization in the Taguibo Watershed area. Planting activities were completed on December 19, 2013. BCWD implemented the latest maintenance activity on November 27-29, 2015, and found out that the survival rate was lowered to 82.50% or equivalent to 495 seedlings out of 600 seedlings originally planted. The previous maintenance activity of the panted seedlings was in July 2015 which resulted to 90.33% or 542 seedlings. The decrease of the survival rate from 90.33% to 82.50% could be attributed to the dry weather condition experienced in 3rd and 4th quarter of 2015 in the Taguibo Watershed. However, to augment or to replace the mortality seedlings, BCWD will conduct replanting activity to achieved 100% survival rate. Maintenance activity for the planted seedlings is the most crucial component for the success of every reforestation project wherein weeds and shrubs are removed and controlled to ensure high survival rate and overall growth of the planted seedlings. As such, BCWD implements periodic maintenance activities of the planted seedlings to ensure optimization of the funds provided by the Joint Rotary Clubs of Butuan North and Makati-Salcedo. The Phoenix Petroleum Philippines, through the Phoenix Philippines Foundation, Inc., implements Corporate Social Responsibility (CSR) through various programs in education, environment, and health and outreach program. Cognizant of the CSC of Phoenix Petroleum, BCWD chairman of Board of Directors Atty. Roldan Torralba requested the Phoenix Philippines Foundation, Inc. to provide fund for BCWD’s Adopt-A-Forest Program in the Taguibo Watershed. In reply, in its letter dated February 20, 2015, said foundation informed BCWD that they have existing program on reforestation called Adopt-A-Site Project. In fact, they have existing partnership with four local water districts namely, Davao City Water District (DCWD), Cagayan De Oro Water District (COWD), Bacolod City Water District (BACIWD) and Metro Cebu Water District (MCWD). Accordingly, all of which were sealed with a Memorandum of Understanding (MOU). The provisions enumerating the support of the Phoenix as approved by their management are uniformly outlined in the said MOU. As such, they provided BCWD with a sample copy of the MOU as their counter proposal for review and consideration of BCWD. After a thorough assessment, BCWD Management and BOD accepted the Phoenix Foundation’s counter proposal. Under its program, the Phoenix adopts an area of five (5) hectares at Php 6,000.00 per hectare per year for a period of five years or in the total amount of ONE HUNDRED FIFTY THOUSAND PESOS (PHP 150,000.00) payable in installment basis at Php 30,000.00 per year. In order to align both Adopt-A-Site Project of Phoenix Foundation and BCWD’s Adopt-A-Forest Program, BCWD’s opted to fill the gap and provide supplemental budget in the amount of Php 150,750.00 making the total amount of the project into Php 300,750.00 for 5-year implementation. Subsequent to the acceptance of the BCWD Management and Board of Directors to the Phoenix Foundation’s counter proposal, a signing of the MOU was then scheduled during the Mindanao Association of Water Districts (MAWD) on November 12, 2015 at SMX Convention Center, Davao City. Immediately after the signing of MOU, a check amounting to Php 30,000.00 was then handed over to BCWD. Procurement for the grafted fruit trees and forest tree seedlings good for five hectares is on process. Coordination with Taguibo Watershed stakeholder or land claimants is done by BCWD foresters. Expected completion of the planting of the five hectares is in the 1st quarter of 2016. The first family who responded to BCWD’s Adopt-A-Forest Program in the Taguibo Watershed is Mr. and Mrs. Atty. Jehremiah and Katherine Asis. The Asis Family donated Sixty Seven Thousand Six Hundred and Ninety-Two Pesos and Ninety Centavos (Php 67,692.90) good for one hectare area. 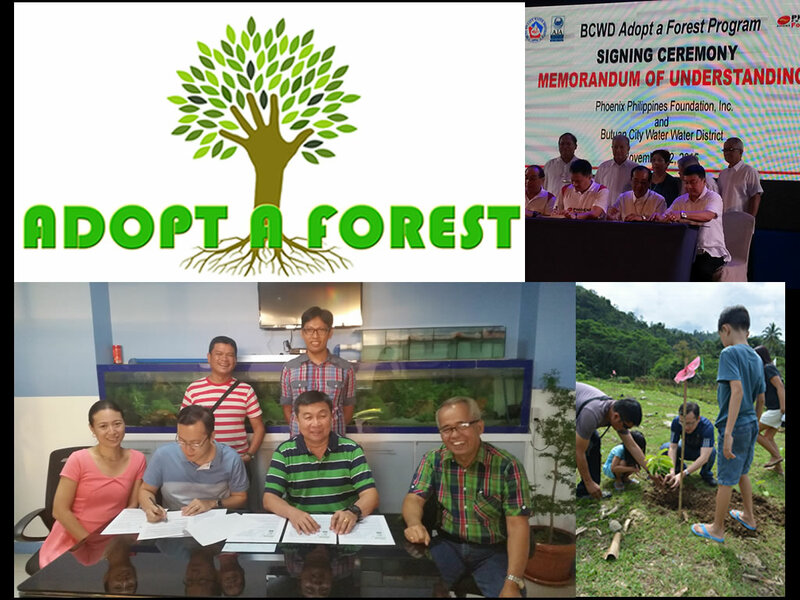 The partnership between BCWD and Asis Family for a one hectare reforestation project for Taguibo Watershed was officially formalized through a Memorandum of Agreement (MOA) signed on December 22, 2015 at BCWD Office, Butuan City. Consequently, a ceremonial signing was then scheduled the following day December 23, 2015 at Sitio Mahyahay, Barangay Anticala, Butuan City portion of Taguibo Watershed.